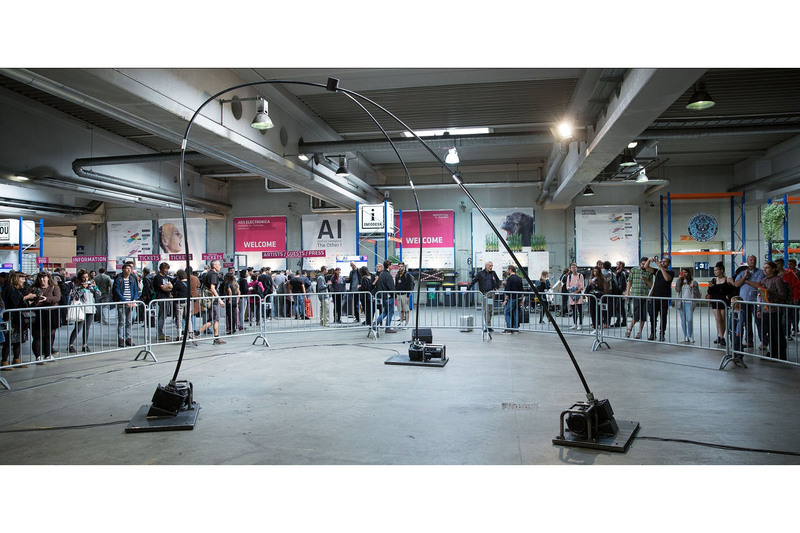 Nyloïd is an impressive sound sculpture, a huge tripod consisting of 3 nylon limbs of 6 meters in length animated by a sophisticated mechanical and sound devices. 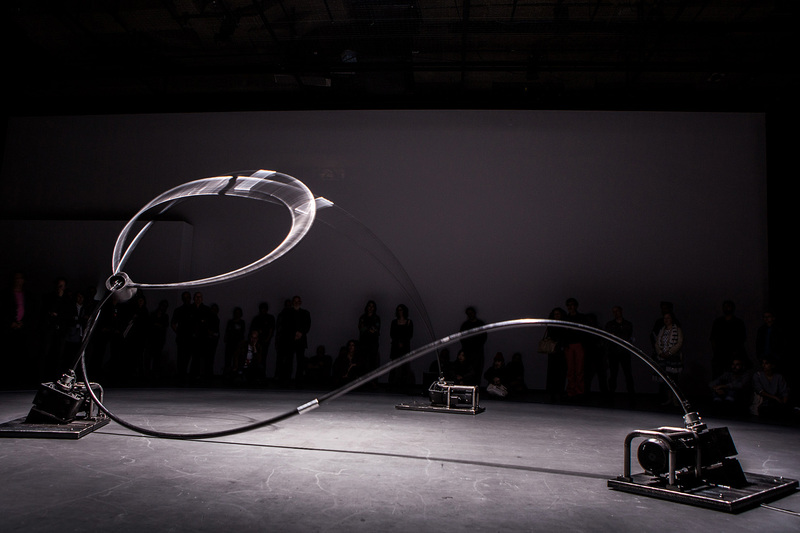 Sensual, animal and threatening, this mobile draws its dramatic power from the reactivity of its plastic and sound material to diverse mechanical constraints. Similar to a living object, its tension, effort and suffering, which result from its contortions and its vocal manifestation, can be sensed. This work constitutes a new stage in our researches. We did new investigations, each within his domain, on plastic and sound organicity to combine them into this fascinating object: a return to life operated by means of mechanics and sound processing. The approach is a long-term reflection culminating in an advanced and complex minimalism. Nyloïd is a rudimentary structure. Often extreme, its movements are at the junction between mechanical perfection and raw material. Its impressive sounds, which seem to emanate from the material itself, are the result of an extremely sophisticated vocal research. 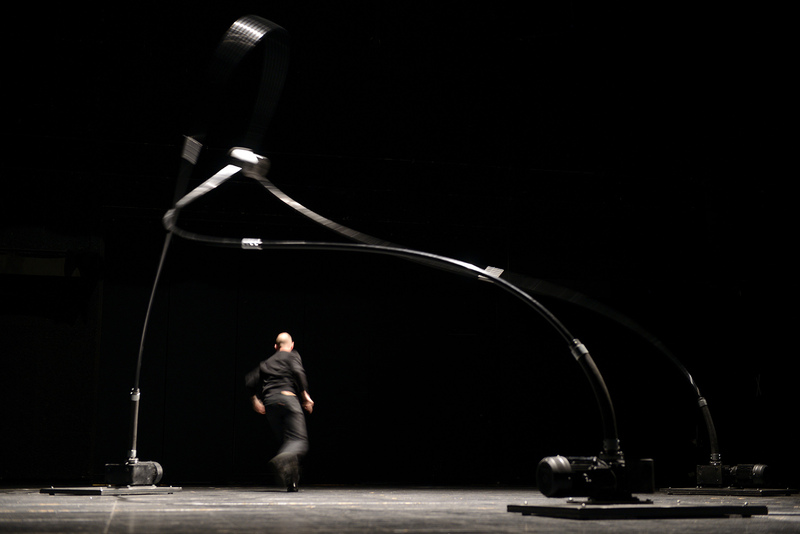 The combination of raw material, mechanical and sound perfection results in a kind of hypnotic and dramaturgic choreography, from which arise, on a paradoxical way, perfectly random kinetics. 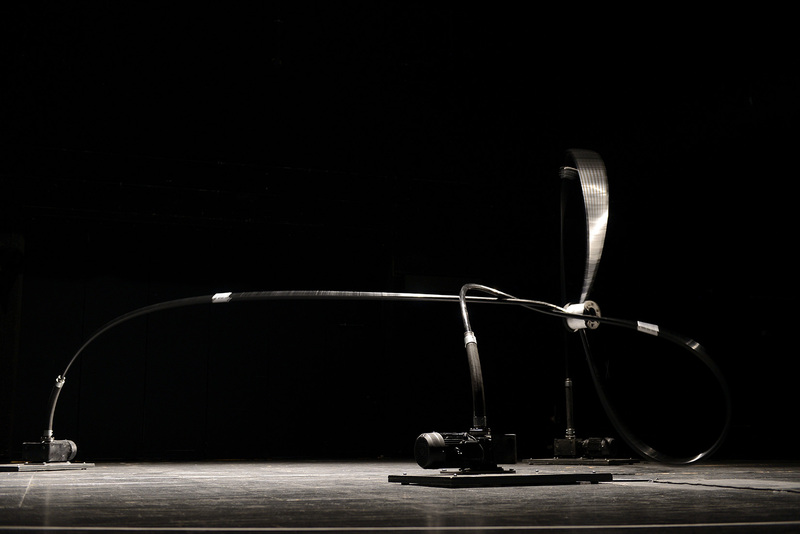 Nyloïd intervenes in the continuity of our researches on mechanical devices that have the capacity to move in an organic, natural, random and harmonious way. 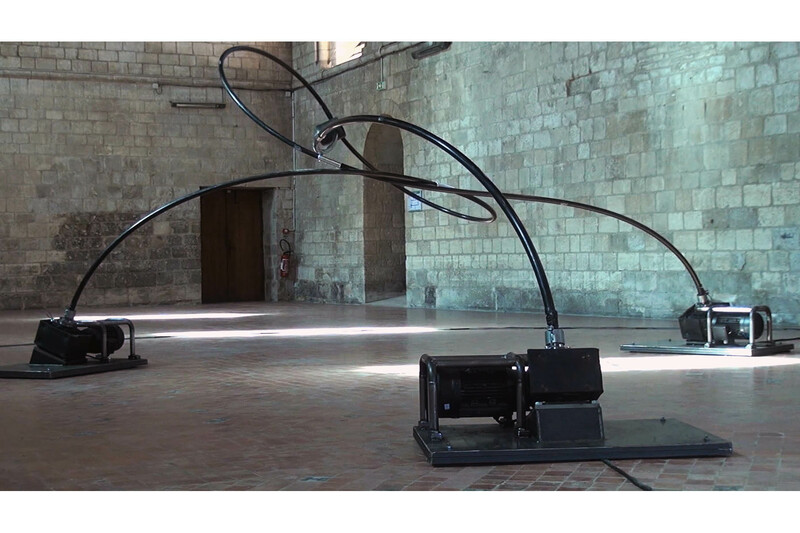 This research began a few years ago with the sculpture Cycloïd-E. Its movements expressed perfectly these phenomena, as if this sculpture possessed a nervous system and could communicate with its environment. From there, we pursued and experimented various mechanisms and realized some of them. We noticed that the complexity of an organic mechanical movement comes from the addition of several types of constraints (flexion, compression or twisting) as well as of several types of strengths acting simultaneously in various directions. The reproduction of this type of movement implies, as in Cycloïd-E, a sophisticated construction, an assembly of numerous parts and mechanical connections and, sometimes, the combination of several sources and modes of activation (engines). As our intention is not to make robots but to reproduce a phenomenon without real function or requirements of precision, we tried to reduce and to rationalize the components of the mechanism by concentrating on the material that makes it up. We began a long research work on materials that might have the expected organic behaviour when distorted, in a way that the working of their internal structure replaces the complex assembly of articulated parts. Our approach consists in a reduction and synthesis that explores the nature of the material and its molecular mechanics.We thus tested the elastic and reversible behaviour of homogeneous materials (metals, polymers) as well as of composite materials (stratified resins, wood, fibres). We observed that some of these materials, submitted to mechanical constraints, have unexpected behaviour, comparable to those of a muscle stimulated by electrical charges. This is the case with polyamide thermoplastics (nylon), which we chose. Once the material was defined, we then searched for simple structures that would render visible the reactions of the material, the strengths and the energies that drive it. In these structures, the natural combination of the potential and kinetic energies stored in the material set under constraint represents one of the essential dynamic components of an organic movement, because it produces unpredictable effects of tension / relaxation, characteristics of the human neuromuscular activity. According to the position of the structure and the distribution of the masses that composes it, the released energy can produce strong accelerations and then, an extremely fast morphological transformation of the structure. 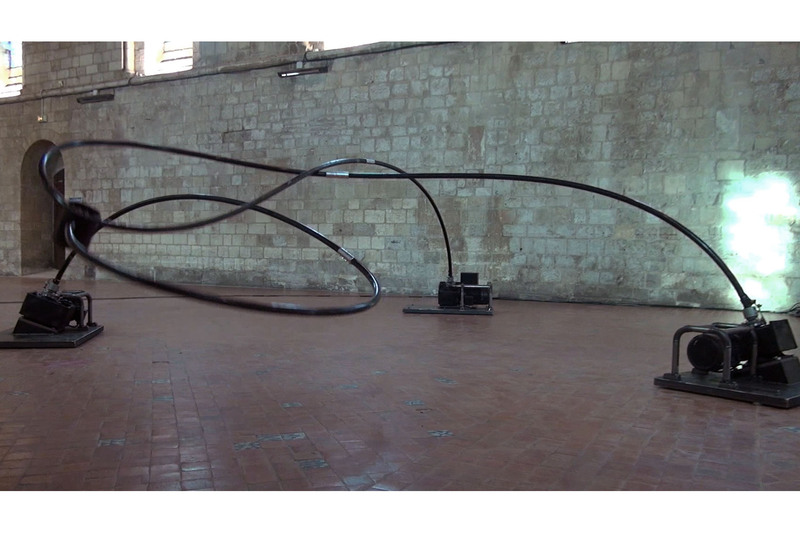 The sound sculpture Nyloïd is the implementation of the observations described above. It consists of three semi-elastics nylon limbs, connected with their extremity so as to form a pyramid with a triangular base, or tetrahedron, which, mathematically, represents the simplest stable geometrical structure. This choice comes from the will to simplify the pattern of its movements in order to accentuate its clarity and its expressiveness. 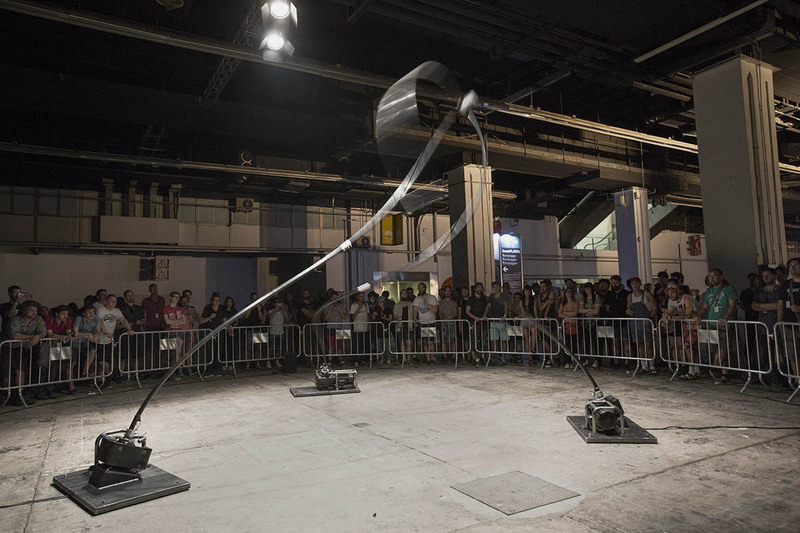 The movement of the structure is produced by the twisting of its nylon limbs, provoked by engines fixed to their bases. The stiff assembly, which connects the limbs at their upper extremity prevents their free rotation and forces them to deform by storing the energy produced by the engines. They twist themselves and get tangled by trying to release the energy they accumulate. This results in unpredictable movements. They are slow in the effort phases and abrupt when all the limbs release simultaneously their energy. The movements are complex. They cannot be completely controlled. Programming the engines only allows for a rough control of their speed and their amplitude. The role of the engines is mainly to bring the limbs back to their initial position when they are too tangled. Finally, the synchronization of the musical device with the movements is realized by measuring accelerations at the top of the structure, and speed and position of the engines. For Cycloid-E, we developed a musical device based on the acoustic principle which specifies that the louder an acoustic instrument is played, the richer the harmonics in its tone are, at the same time becoming clearer and more brilliant. 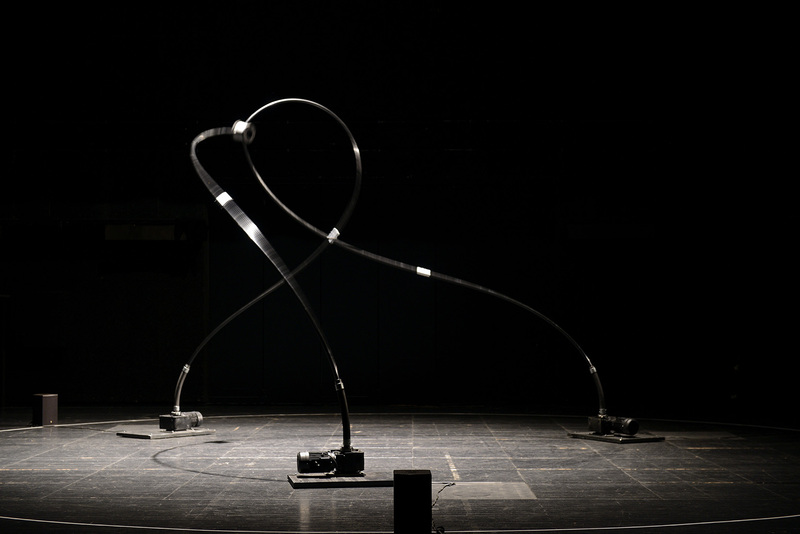 The music of Cycloid-E accompanies its own movements by adapting expression, combinations of tones, and brightness. After this experience, we tried to improve the musical device to make it more flexible and more organic. 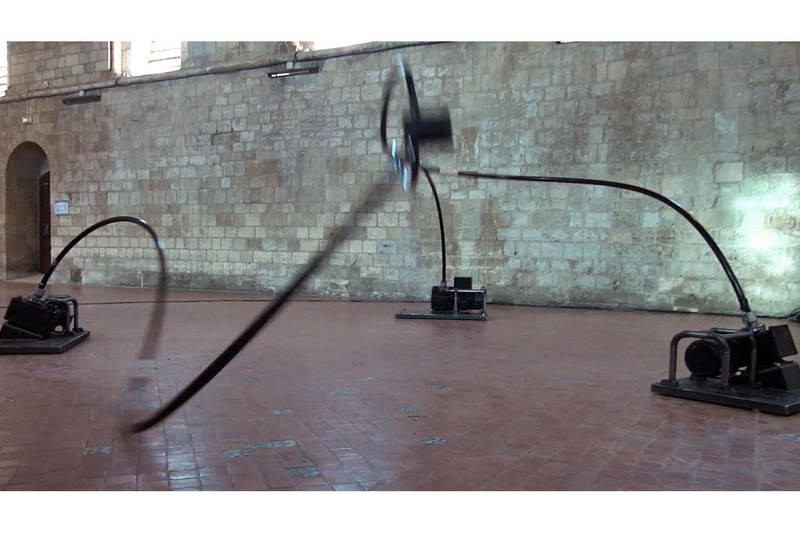 We looked for means to compose musical phrases in real time by morphing sound fragments. We wanted to create hybrid musical sequences by switching spontaneously and without discontinuities between sound tones coming from various sources. We made tests with many different sounds. Among them, the spoken voice particularly fascinated us. On the one hand, it exercises on us an irresistible attraction; on the other it brings a very concrete and emotional dimension to the musical language. Finally, the wealth and the diversity of the sounds that the voice produces make for an exceptionally flexible and subtle musical instrument. We pursued our researches on the theme of the voice, particularly on computer-generated speech. By using synthesis and digital treatment, the voice is brought back to a state of tone and vibration and becomes raw material. It takes on a plastic consistency and recovers an archaic energy, as if it returned to its origins. Always striking, the voice oscillates between inarticulate expiration and furious primitiveness, sometimes giving way to explosive fury. In spite of its at times disquieting sounds, the voice always stays very close to the essential. Its immediacy touches our senses and our emotion. The voice is perceptible through its breath, the noise, the sound and the tone, with which it maintains an Aristotelian rapport. 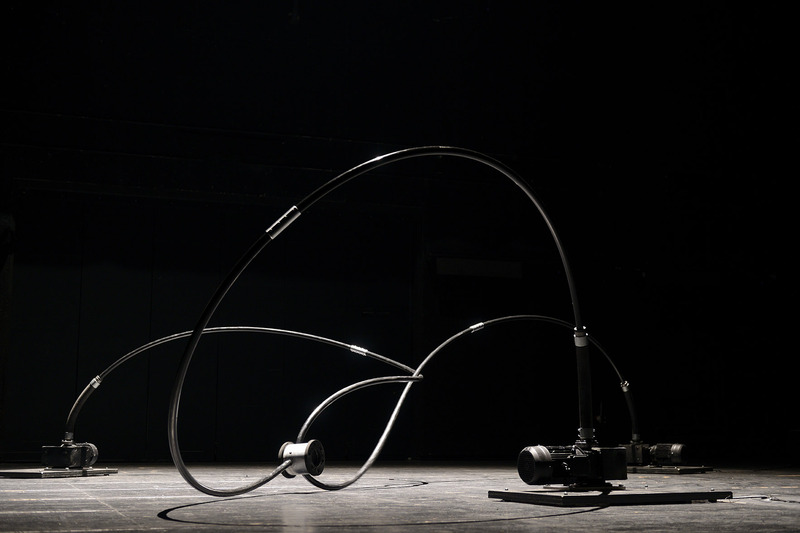 The musical composition of Nyloïd is controlled by a continuous follow-up of its movements. The musical composition develops from the voice, synthesized from a wide range of expressions and a wealth of textures. The voice follows the tensions and contortions of the sculpture, sometimes as burst fragments, sometimes in broad incisive textures, sometimes in spasmodic expirations. If the movements stop, the voice stops as well, silence becomes menacing.